I began my musical journey when I was only 5 years old. My mother started me on the piano and by age 12 I had begun to learn the guitar. As the years went on, I followed after my dad's multi-fluency in fretted instruments - to include the mandolin, mountain dulcimer, some banjo and so on; but our family heirloom fiddle remained firmly out of reason as my Pap passed on before teaching any of us how to play it. Determined to learn, I set out to teach myself how to tame the strings; but it was a slow and difficult task - as the lack of frets intimidated my instincts on this unforgiving instrument. Then one day while browsing the internet with the question, "Do fretted fiddles exist?" ... I found it! This neat little product by a Canadian inventor (Mr. Peter Stoney) opened the door I had been longing for. Now, 10 years later, I learned that a capo for the fiddle also exists! So I've received a new set of frets and the capo to install and provide this review. The Fiddle Fretter is sold in pairs of the stealth frets (without indication dots) and the standard classic frets. Each one has a peel-able adhesive back, and is installed directly to the fingerboard of the violin. (go to http://www.frettedfiddle.com/ for full installation instructions) // The installation process only took me less than 5 minutes, and then a minute or so to retune the strings. // The frets themselves are thin little contoured metal bars that can be felt by the fingers. Once installed, the fretboard allows you to finger the fiddle like you would a mandolin (or any other fretted instrument) and land directly on note every time. And contrary to what some of my fellow fiddlers warned me - these frets DO NOT prohibit you from being able to "slide" into a note. (See my video demonstration below). The capo is sold separately from the frets; and consists of a sturdy, flexible pin surrounded by a pliable rubber sheath. The end of the pin has a strong elastic ring attached, which is pulled around the back of the neck by the included hook - and then secured on the other side. (go to http://www.frettedfiddle.com/ for full installation instructions). The installation of the capo takes less than a minute, and it can be used with or without the fretboard installed. The fiddle frets allowed me to not only quickly train my fingers of their proper position on the fingerboard, but they also allowed me to jump right in with playing along with other musicians and during bluegrass jams. After a year of my first use, I was then able to remove them and play without. I have, however, decided to keep a set on one of my newer fiddles; and enjoy the ease of play during our nights playing out at the old folks home. With the new capo included, I am now easily able to play along with several hymns and songs at church without needing to practice first! I strongly recommend these frets to anyone who wants to learn to play the violin, especially if they already play another fretted instrument! Disclosure: Work'n Man's Life received a sample capo from The Fiddle Fretter for this review. The opinions expressed in this blog are solely those of the author and have in no way been influenced by or reflect those of The Fiddle Fretter company. The first thing we noticed upon unboxing it was the sturdy steel construction. It's certainly solid, yet just light enough to pick up and move with ease. The base of has two holes drilled opposite across the diameter, which allow you to screw, bolt, or nail the cracker down. Though this is ideal for keeping the cracker still while using, we demonstrated it without being fastened down. This cracker was designed to provide a safer method for splitting your kindling; and as we found - it is just that! 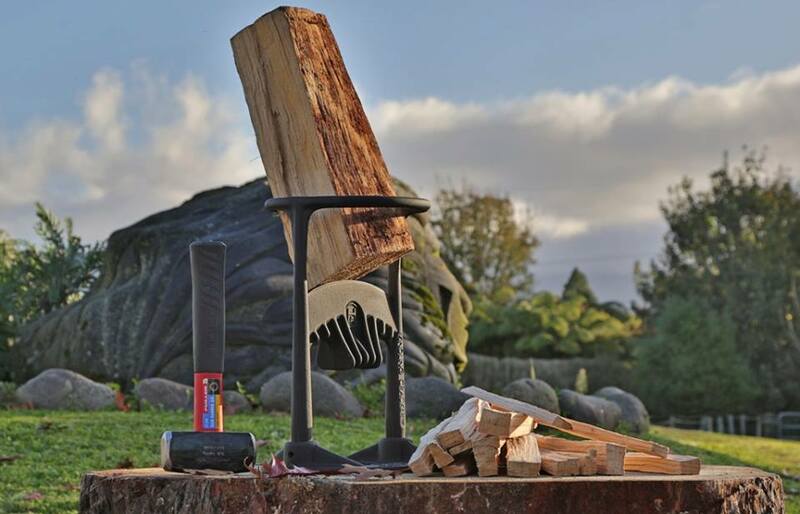 The inverted bevel allows you to bring the kindling square down on the axe instead of bringing an axe down on the kindling - thus preventing potential cut injuries to your hands and legs. 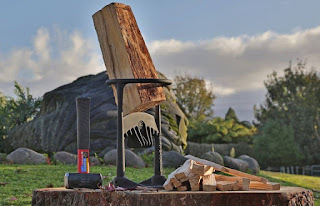 While the Kindling Cracker certainly does make a quick and painless job of splitting the intended seasoned firewood chunks, we decided to put it through our doomsday test and throw the book at her! (or in this case, the whole forest and woodshop...lol) While this product is not officially intended by its creators to split actual logs; we found that it's capable of just that! With a little elbow grease and the sweat of a work'n wife's brow, this kindling cracker even split unseasoned ash! Off the camera, we went on for a total of 8 ash logs -the biggest that we could fit in the cracker- and it held up strong through it all. The Kindling Cracker is available for order online at Northern Tool or at the Kindling Cracker website. This tool would make a fine present for anyone to keep by their woodstove or campsite, and for shaving some time off those cold mornings when first getting the fire going! Disclosure: Work'n Man's Life received a sample Kindling Cracker from Northern Tool for this review. The opinions expressed in this blog are solely those of the author and in no way reflect or are implied to reflect those of Northern Tool. Being as I always like to learn something new, I can't believe I didn't know about the Hoppe's 9 Boresnake for cleaning the rifle! 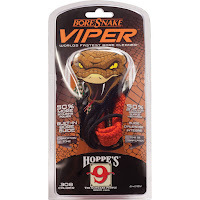 My brother-in-law Jason was kind enough to bring his Hoppe's 9 cleaning kit on out to demonstrate how easily it works at restoring the rifle to optimal condition. You can see this demonstration in this video (as well as the unfortunate demolition of our favorite treestand).